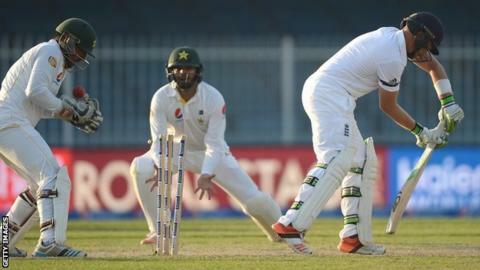 England's hopes of winning the final Test against Pakistan were dented by the loss of two wickets in quick succession late on day four in Sharjah. Moeen Ali and Ian Bell perished in the space of 13 balls as England - chasing 284 for victory and a 1-1 series draw - reached 46-2 in the 22 overs possible. Shoaib Malik, who announced his retirement from Test cricket on Tuesday, claimed both wickets. Earlier, Mohammad Hafeez hit 151 as Pakistan were bowled out for 355. If England are to achieve their highest successful fourth-innings chase in Asia, they must do so against a three-pronged spin attack on a wearing pitch and with Ben Stokes' batting severely hampered by a collar bone injury. Has Bell played his last Test? Moeen's departure for 22 - lbw pushing at Malik with minimal foot movement - exposed Bell, who, expecting spin where there was none from round the wicket, played inside the line to have his off stump pegged back. While Moeen's promotion to the top of the order has yielded only 84 runs in six innings, the manner of Bell's dismissal for a duck led to renewed doubts over his place in the side - and his 118-Test career. "He won't retire and they won't sack him because they haven't got anybody else," former England batsman Geoffrey Boycott told BBC Test Match Special. "He's got all the talent in the world but he's flaky in the head." As so often has been the case in recent times, England's prospects of victory will rest heavily on captain Alastair Cook and Joe Root, who will resume on Thursday on 17 and six respectively. Hafeez's 151 was the main reason England were kept in the field beyond tea. Like the previous day, he enjoyed moments of fortune. Jonny Bairstow missed a stumping off an Adil Rashid googly in the first over of the day, while Stuart Broad put down a low one-handed chance in his follow-through with the opener on 113. Hafeez went on to add 93 for the fifth wicket with captain Misbah-ul-Haq, who was lbw for 38 playing back to the impressive Broad. Even after Hafeez chipped Moeen to Bell at long-on, England were frustrated by a run-a-ball 36 from Sarfraz Ahmed which was ended by a terrific delivery from Samit Patel which pitched on leg stump and hit off. One of several Rashid long hops accounted for Yasir Shah, but James Anderson dropped a straightforward chance to allow Asad Shafiq to further frustrate England alongside Wahab Riaz. Broad and Anderson were exemplary once again with the ball, combining control and penetration in conditions which continued to offer little for the seamers. Broad finished with 3-44 from 23 overs and Anderson 2-52 from 26, but spinners Rashid, Moeen and Patel returned combined figures of 3-248 and managed only five maidens in 69 overs. Former England spinner Phil Tufnell told TMS: "Some of the deliveries have come down with a bow on them - 'here you go, smash that to the boundary'." Ex-England captain Michael Vaughan added: "It has been a full toss-athon. Graeme Swann didn't bowl an apologetic delivery like these England spinners. "They have got the best options for these conditions but they are not bowling well enough."